Wondering if teeth whitening in one day is even possible? Yes, it is! While people are busy looking into over the counter teeth whitening options, there is a faster way to do it. There are many choices available, but professional teeth whitening is still the ideal whitening choice. The take-home whitening options are simply not able to offer the quality whitening ingredients that a dentist can give. When someone chooses at home options, they are using this choice at their own risk. 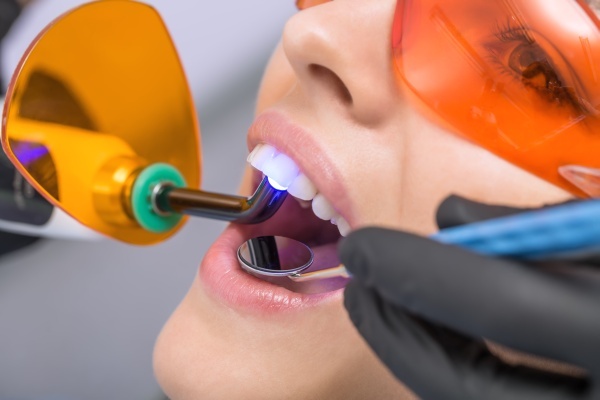 When someone chooses professional, in-office teeth whitening services, they will be carefully monitored. This allows for the safest use of teeth whitening ingredients. In-office teeth whitening services give patients the personalized attention they to improve their teeth. When someone chooses professional whitening services, they are choosing a serious way to whiten their teeth. This means they can expect their teeth to look stunning upon completion. An experienced dentist knows exactly how to remove any stains or discolorations on your teeth. They will find a solution even if your discoloration was caused by eating or drinking thing like coffee, smoking cigarettes or aging. Who is a candidate for in-office teeth whitening services? You need to make an appointment with your dentist to learn if you are a candidate for professional teeth whitening. Here, they can discuss their medical history and preferences. Generally speaking, a great candidate for in-office teeth whitening treatments is someone who has no oral problems and is in good overall health. In-office teeth whitening services will take anywhere from 30 minutes to 90 minutes to complete and can whiten your teeth up to seven shades. Dentists use whiteners that are much stronger than over the counter options. This is why you will see impressive results if you choose professional teeth whitening. Receiving treatment in one day also beats having to wear whitening trays or strips for a few weeks. Ready to get your teeth whitened? Do you have any more questions about teeth whitening in one day? Are you ready to get your teeth professionally whitened so you can be proud to show them off? When you are looking for the ideal ways to whiten your teeth, know that only a dentist can provide you with the safe whitening treatments you need. It may be tempting to choose one of the many over the counter teeth whitening products. Remember that they do not always work as well as professional whitening treatments, especially for certain types of discoloration. Some of them will also contain potentially harmful ingredients, making it necessary for you to first understand the ingredients before making a decision. You can avoid any worries or potential complications by calling us today to schedule an appointment for teeth whitening in one day. Our friendly staff will be happy to discuss the treatment method and answer any other questions.